Up to 38% Off the gate price! GATE-READY ticket: No need to queue, just scan yourself in! Scannable e-ticket - no need to queue! 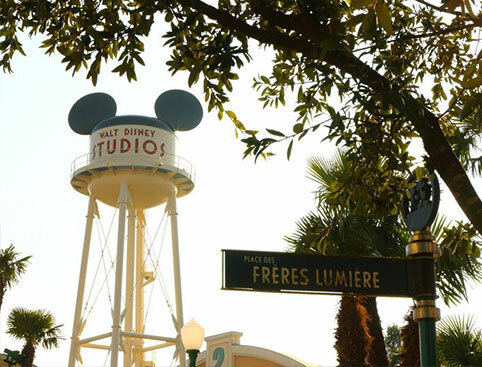 Hop between Disneyland® Park & Walt Disney Studios® Park as much as you like for 3 days within a 7-day period! 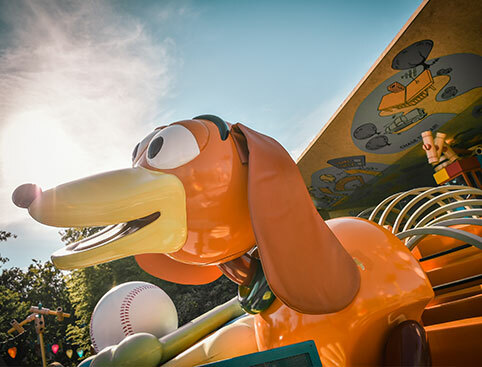 Hop between Disneyland® Park & Walt Disney Studios® Park as much as you like for 4 days within a 7-day period! A monster-sized party, with stunning shows and amazing animations! Enjoy a delicious 2-course meal at the star-studded Planet Hollywood at Disneyland Paris! 2 When are you going? FASTPASS® to skip the queues for the most popular rides! GATE-READY ticket – no need to queue, just scan yourself in! The Super Magic Ticket covers ALL dates within the season* you have selected, including the most popular dates such as Halloween, October half term, weekends in November and the 2-week Christmas break. This ticket gives you full flexibility to visit Disneyland® Paris on any date within the season, so it’s the perfect ticket if you think you might change your mind! The Magic Ticket covers all off-peak dates and also some more popular dates within the season* you have selected, so you have more choice of when to visit. The Mini Ticket covers only off-peak dates within the season* you have selected. Once you have selected a date, you will be able to see all the dates that your ticket will be valid. IMPORTANT: If you visit on a date that your ticket is not valid, you will need to pay the difference to upgrade your ticket in order to enter the park. *The Standard Mini, Magic and Super Magic tickets are valid until 31st January 2020. Your ticket will be valid for any dates corresponding with the ticket type you have selected until 31st January 2020. The ticket you receive is only valid on the day you enter the park. Please Note: 100% cancellation fee – no amendments. GATE-READY tickets – no need to queue, just scan yourself in! This ticket is valid for 2 days within a 7 day period after first day of use. Simply print off the e-ticket and scan at special machines outside the parks, so you won't need to queue at the ticket booths. Your ticket must be used for the first time on the day you redeem your e-ticket at the park. This ticket is valid for 3 days within a 7 day period after first day of use. Please Note: 100% cancellation fees apply – no amendments. This ticket is valid for 4 days within a 7 day period after first day of use. Enjoy a delicious 2-course meal at the world-famous Planet Hollywood in the Disney Village! Planet Hollywood is open all year round from 11:30am – Midnight. Dates such as Christmas Eve, Christmas Day, Boxing Day, New Year’s Eve and New Year’s Day are not available. A main meal, dessert and drink at Planet Hollywood. Transport to and from the restaurant. The UK's Largest Seller of Disneyland Paris Tickets! 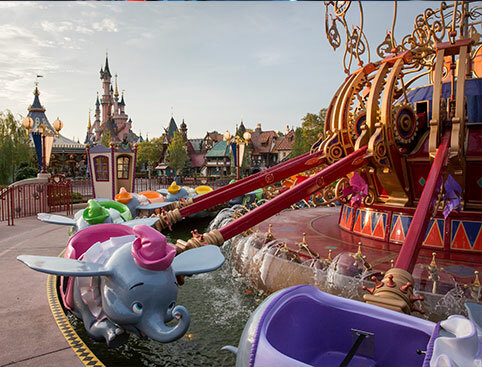 Our cheap Disneyland® Paris tickets give you admission to both of the Disney theme parks - Disneyland® Park and Walt Disney Studios Park - so you won't miss a single second of the magic! Why book your Disneyland Paris Tickets with us? We've been officially voted Disneyland® Paris' Largest Ticket Partner of 2018! 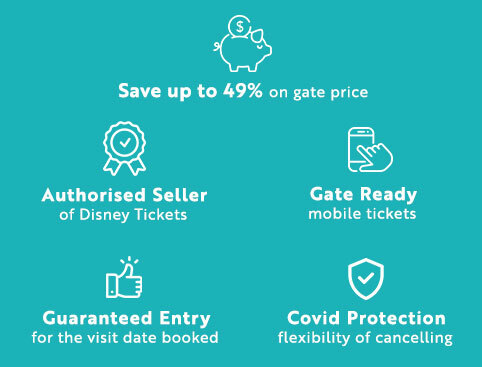 Our 1-day Disneyland Paris tickets are gate-ready e-tickets, so there’s nothing to redeem or exchange - just walk straight up to the gates and enter! Just pick up a return time for your chosen ride, go off to have fun elsewhere in the park, and return at your specified time. These guys are glad they did! Both restaurants are in Disney® Village, located between the entrances to the two Disneyland® parks. Check out our Ultimate Guide to Planning a Trip to Disneyland Paris to make the absolute most of your trip. *During peak times there may be limited availability for FastPass® time slots at popular attractions. ** Earl of Sandwich voucher entitles the bearer to a €3 credit (up to 20%) off a total minimum spend of €15 on food & drinks for travel up to 31st March 2020 excluding 31st October & 25th December. Planet Hollywood voucher entitles the bearer to a 15% discount off food and soft drinks ordered from the a la carte menu, and 15% off any purchase of merchandise excluding sale items, with visits until December 30th 2019. Valid for a maximum of 8 persons dining together. Not valid with any other offers (e.g. kids Meal Deal) or discounts. The parks usually open at 10am but closing times vary depending on the season. For specific opening times, we recommend that you check with the park before your visit. Kids aged under 3 enter the park for free! Your child won't need a ticket provided they are under 3 years old on the first day you use your tickets. Staying at a Disney hotel? You’ll be able to use the car parks free of charge! For safety reasons, height restrictions apply on some rides. Some rides also have other recommendations, particularly for expectant mothers or those with heart, back or neck problems. These restrictions and recommendations are posted at the entrance to each ride or attraction. Accessibility is excellent for guests with disabilities. Specially adapted ride and attraction entrances, wheelchair rental, special parking, adapted facilities and much more is available in both parks and at Disney Village. Large coolbags and picnic hampers cannot be brought into the park. Picnics are not allowed, although small snacks such as cereal bars or croissants etc, are permitted. Bottled water can be brought into the park and topped up at the drinking fountains. Specially designated smoking areas can be found throughout both parks. These are clearly marked on park maps and guides. We will email you an e-ticket which you must print out and take with you. Tickets are non-refundable and non-transferable. Once you have selected your date, you will be able to see all the dates that your ticket will be valid. *Disneyland Paris split their ticket availability into two seasons: Summer tickets and Winter tickets. Disneyland® Paris is within easy reach of the major international motorway networks, just off the A4 motorway at Boulevard du Parc, 77700 Coupvray, France. On the Périphérique, at the "Porte de Bercy" exit (south east of Paris), follow signs for "Metz / Nancy" on the A4 motorway. Take exit 14, signposted "Val d'Europe, Parc Disneyland". From the airport, follow signs for "Marne La Vallée" until you reach the A104 ("La Francilienne"). After 27km, leave the A104 for the A4, following signs for "Metz / Nancy". Exit 13 is 9km further on, and exit 14 is 12km. From the airport, follow signs for "Paris" and then for "Créteil" on the A86. After 11km join the A4 heading towards "Metz / Nancy". Exit 13 is 27km further on, whilst exit 14 is 30km. Eurostar provides a high-speed train service direct which gets you from the heart of London to Disneyland Paris in just 2 hours and 30 minutes. If you’re travelling on Eurostar from Ashford in Kent, the direct time is even faster; less than 2 hours! Line A4 on the RER (Réseau Express Régional) is the rapid suburban train system that will take you from the centre of Paris in about 35 minutes. Staying at an on-site hotel? A free shuttle service is available between the Disneyland Paris hotels and parks. Winner of the TripAdvisor Travellers' Choice Award, Buffalo Bill's Wild West Show is known as the greatest Disney Dinner Show in the world! This gun-slinging live arena show is hugely popular so advance booking is ESSENTIAL. No-one celebrates the holidays quite like Mickey, Minnie and chums! If you’re visiting around Halloween, Christmas or New Year, you won’t want to miss the exclusive parties & celebrations. Feeling hungry? Celebrate a busy day of fun with a slap-up meal at the world-famous Planet Hollywood At Disneyland Paris! Every Disneyland Paris booking will include a free 15% Planet Hollywood voucher and a free 20% Earl of Sandwich voucher. Valid for a maximum of 8 persons dining together. Not valid with any other offers (e.g. kids Meal Deal) or discounts. Voucher entitles the bearer to a €3 credit (20% discount) off a total minimum spend of €15 on food & drinks. Not valid in conjunction with any other offers, discounts or meal deals. No cash value or return. Non transferable. Disneyland Paris Tickets is rated 4.6 out of 5 by 1596. 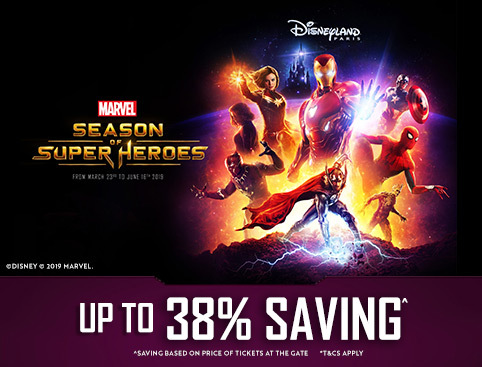 Rated 5 out of 5 by Babyrony66 from Perfect experience I bought disney tickets at a great price with fast pass and i recieved the tickets immediately on my email. Rated 5 out of 5 by Andyf from Amazing time at Disneyland paris Bought are 2 park 3 day tickets through attractiontix and they cudnt have been nicer. So easy to redeem the tickets at the park with the printed voucher. Rated 5 out of 5 by Jo2010 from Fantastic trip Purchased tickets for a two day pass to both resorts in Disney. First time I had purchased from a website I did not know. The whole process was simple, purchase and print, scan at the gate when you arrive at Disney. I did ring for assistance before purchasing, my call was answered immediately and the advisor talked me through every step very helpful. Rated 5 out of 5 by Bexwx from Amazing day out Amazing day for kids and adults a like. Worth it for the light show at the end only which was absolutely incredible. Ride queues aren’t too bad at all. Rated 5 out of 5 by Qama from Fantastic weekend We bought tickets for my family for two days at Disney land. I can simply say it was magical, a piece of paradise for children and us adults. We were all kids once we entered Disney. Had a really fabulous time!